SYNOPSIS: From Disney and Jerry Bruckheimer Films, “Pirates of the Caribbean: Dead Men Tell No Tales”—the fifth film in the now-iconic “Pirates of the Caribbean” film franchise—will sail home on Digital in HD and 4K Ultra HD™ on September 19, and on 4K Ultra HD™/Blu-ray™ Combo Pack, DVD and On-Demand on October 3. “Pirates of the Caribbean: Dead Men Tell No Tales” is a rollicking new tale of the high seas, infused with all the elements of fantasy, humor and action that have resulted in an international phenomenon for the past 13 years. Johnny Depp returns to his Academy Award®-nominated role as the outrageous, swashbuckling scoundrel Captain Jack Sparrow, and is joined by Oscar® winners Javier Bardem (Best Supporting Actor, “No Country for Old Men”) and Geoffrey Rush (Best Actor, “Shine”). Fans who bring home “Pirates of the Caribbean: Dead Men Tell No Tales” will experience the nonstop action in stunning 4K Ultra HD format, the ultimate home entertainment experience with next-generation high dynamic range (HDR) visuals and Dolby Atmos immersive audio. Bonus material includes a collection of behind-the-scenes, making-of stories, including a conversation with directors Joachim Rønning and Espen Sandberg; a sit-down with the two young newcomers who play Henry and Carina; the secrets behind the menacing new villain, Salazar, and his ferocious ghost sharks; an on-set visit with Jack’s first mate from all five films; a chat with Sir Paul McCartney who appears as Uncle Jack; and a discussion about the franchise’s legacy; along with hilarious bloopers, deleted scenes and memories from producer Jerry Bruckheimer’s photo diary. 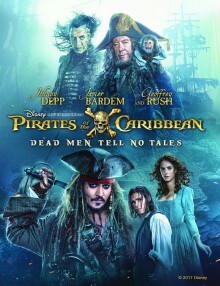 The rip-roaring adventure—packed with humor, suspense and jaw-dropping special effects—finds down-on-his-luck Captain Jack feeling the winds of ill fortune blowing strongly his way when deadly ghost sailors, led by the terrifying Captain Salazar (Bardem), escape from the Devil’s Triangle bent on killing every pirate at sea—notably Jack.